A surprise call of my life stunned me this afternoon. It was from 20th Century Fox studio, via George Light, for an interview (for a role) tomorrow. I never heretofore -- like the last call from R.K.O. Radio -- heard from this studio. I was thrilled no end -- & so were all of my brood of kids & wife. It means food. My first call from 20th Century Fox studios! I can't believe it. For about two years George Light was going to cast me in a role out there -- and now I am called by him, interviewed by Mal St. Clair, fitted into a cowboy outfit & told to report for work tomorrow at 8 A.M. It just about was like this -- fast, unexplained, hurried through -- and cinched! I haven't been told what kind of role, in what scene, what dialogue -- only that "it's comedy and requires good timing." It had me baffled, I admit. With that -- and butterflies (as always with a new role!) in my tummy -- I came home. Even though my painful lack of sleep last night was against me I still felt like my old self again -- an actor! I came out to 2oth Century Fox studio early, in fact, very early. Checked in, was made-up like a cowboy hombre, clad in Western boots and hat and soon was on Stage 14 where Mal St. Clair, a genial expert director of comedy, had me in suspense until after lunch. While watching two other actors go through their individual scenes I was busy imagining several different versions of "my scene." But -- when my time came to contribute to Preston Sturges great technicolor feature "Beautiful Blonde from Bashful Bend" -- I wasn't allowed to do any of my self-created versions! Wowie! Instead I was given to do the most with the least, and no dialogue, except a little ad-lib! I was to be a tough-looking tobacco chewing Western hombre who sneaks into position in a barn & while shooting a big horse-collar falls on me and after I gather myself to my feet I am found to be tangled in a helpless mess -- with big eye-blinders on. After I completed the scene -- after several false starts by technical men -- I was congratulated by the director -- and I went home happy. Yesterday, too, I met Betty Grable and Preston Sturges and Caesar Romero -- for the first time. But in a way that perhaps they shall not remember me, and won't even know I'm playing in the same picture they star in: "The Beautiful Blonde from Bashful Bend." Someday I had always intended to be in the positions they hold. And if my injured nose & neck don't get & keep in my way I shall keep to that goal. This reference to the on-going health problems he sustained working ten months earlier in BILLIE GETS HER MAN (1948) concludes Emil's personal written memory of his first and only role for Twentieth-Century Fox, in a film whose commercial failure marked the end of the career of well-known Hollywood writer, director and producer Preston Sturges. Sturges leaped to fame and fortune after he won an Oscar for Best Screenplay of 1940 for Paramount Studio's THE GREAT MCGINTY, which he also directed. He went on to write and direct a string of box-office successes over the next five years with famous stars such as Veronica Lake, Joel McCrea, and Claudette Colbert. Reviewers and audiences alike enjoyed his work, which had evoked words like "masterpiece" and "genius" from the critics, and he was considered one of the preeminent filmmakers of the era. By the time THE BEAUTIFUL BLONDE FROM BASHFUL BEND was made in the late 1940's, things had changed. Sturges had left Paramount, worked on two troubled projects with Howard Hughes, and found himself at Twentieth Century Fox. This was his second film for the studio, where he was reportedly one of the highest-paid people in Hollywood. Unfortunately for Sturges, his first effort, UNFAITHFULLY YOURS (1948) starring Rex Harrison, hadn't lived up to expectations. 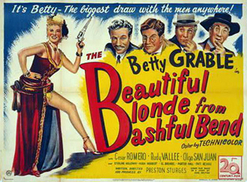 When THE BEAUTIFUL BLONDE FROM BASHFUL BEND flopped in 1949, Sturges found himself unemployed. Despite major stars Betty Grable and Cesar Romero, the movie was rejected by critics and fared poorly in theaters. It was the last film Sturges made in Hollywood. It didn't help Betty Grable's career much either. Betty Grable had become known as "America's Pin-Up" during WWII, although she'd been working in films since 1930 when she was 14 years old. For a decade, Grable enacted dozens of roles before landing a major part in DOWN ARGENTINE WAY in 1940. She subsequently starred in a series of hits and became world-famous for her attractive legs. Grable, who wed big band leader Harry James in 1943, was the highest paid woman in America in 1947, according to a U. S. Treasury Department report. And the world was wowed when a Hollywood studio insured her legs for a million dollars with Lloyd's of London. Like Preston Sturges, Grable's popularity went up rapidly in the early forties but sank toward the end of the decade. BEAUTIFUL BLONDE FROM BASHFUL BEND didn't end her career, as it had with Sturges, but she did make only a handful of films afterward and retired from movies within several years. 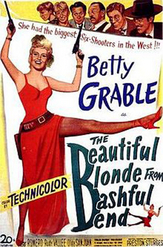 Betty Grable Tames the Wild West! 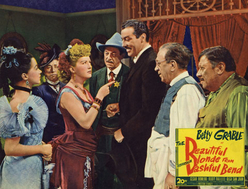 Preston Sturges directed Betty Grable in this wild six gun farce set in the old West. Freddie (Grable) is a hot-tempered saloon entertainer who's as quick with a pistol as she is to kick up her heels. Cesar Romero co-stars as her boy-friend, a handsome rogue with a wandering eye. After one too many amorous glances in the wrong direction, Freddie tried to gun the varmint down, only to wind up running from the law and getting caught in the middle of a mining town feud. While the smoke clears, the slapstick gags fly faster than the bullets as Betty Grable brings her own brand of justice to the frontier. Want to settle an argument in a hurry? Just call THE BEAUTIFUL BLONDE FROM BASHFUL BEND. Color, 1949. 77 Minutes. Grable's co-star Cesar Romero began working in films in the early 30's, appearing in numerous films throughout the 1940's, and he was a well-established leading man when this movie was made. Although some film buffs consider him the quintessential "tall, dark and handsome" movie star, I remember Romero as "The Joker" in the Batman television series starring Adam West and Burt Ward in the 1960's. Emil's diary entry mentions meeting Preston Sturges, the director of record for this film, but he also clearly names Mal St. Clair as the director he worked with, describing him as "a genial expert director of comedy," a pretty flattering statement. However, St. Clair's name doesn't appear on either my video's cover or in the film's credits. Perhaps the work of Sturges' assistant directors went uncredited. 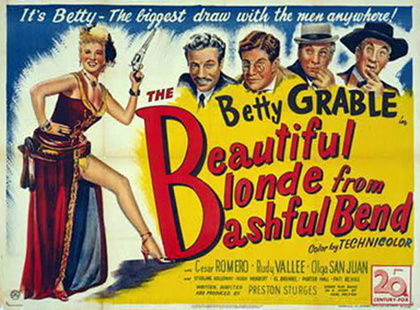 Marking the end of Preston Sturges' career and the decline of Grable's, THE BEAUTIFUL BLONDE FROM BASHFUL BEND didn't help Emil's career much either. Although he did get a day's work out of it, this was the only job he ever got at Twentieth Century Fox. And to top it off, it appears to me his scenes were cut from the movie! After reading Emil's description of his role, I watched the video closely several times. It's not difficult to figure out just about where Emil's scene would fit into the storyline, but it's simply not there in the film. I've also looked at all the scenes featuring a "tough-looking tobacco chewing Western hombre," of which there are many, but I couldn't find him anywhere. Of course, I may have missed him I suppose, or it's possible the version I've got has been edited from the original theatrically-released version of 1949, so it's possible Emil did appear in this film. More likely, Emil's scenes "ended up on the cutting room floor," as they say. As a commercial failure, this movie was unappreciated in its day, but I watched it without expectations of greatness and found it funny and entertaining. A lot of the humor is corny and the plot simplistic and predictable, but it nevertheless is an interesting comedy that brings stars Betty Grable and Cesar Romero, as well as co-stars Rudy Vallee and Olga San Juan, together with several veteran Columbia short-subject comedians. Hugh Herbert, El Brendel, and Sterling Holloway all have prominent roles, and the large cast includes Chester and Heinie Conklin, Blackie Whiteford, Snub Pollard, Esther Howard, and Dudley Dickerson, among others. Years later, Emil would work in another film starring Betty Grable in THREE FOR THE SHOW (1955) co-starring Jack Lemmon and Marge and Gower Champion. does reveal the nature of the last Hollywood film of Preston Sturges.